Religion’s not your thing? You say that attending a Church service is passé, or irrelevant? Tell me your story. Okay, I catch your drift, and I really do understand how you feel. But, to my way of thinking, you are just one of a multitude of “happy agnostics” for whom God is… well… whatever God is. Yes, for many those are some of the main reasons. Week after week people all over the world respectfully go through the motions prescribed by their religion more out of blind tradition than genuine devotion. That’s the problem with vision-less religion in general. How do you define religion? Is it just a set of philosophies which help you to understand the cause, nature, and purpose of the universe? Is it something that you follow with blind ritualistic devotion? Is it an acceptable moral code for governing the conduct of human affairs? And if so, does that make “church” an assembly of persons who share a common adherence to a particular set of doctrines and practices which help to manage their lives on earth? Or is religion the hunt for the truth? Well for one, I care. And, no, I do not believe that everyone can have their own private interpretation of “Truth.” Some things are absolute. To me, knowing the absolute truth is very important. I suspect that I am not alone in this conviction. No sane person would deliberately believe in a lie. Would you? For some, truth is living in harmony with perceived fact or moral conviction. But, is that just the product of a cultural consensus? Is truth subjective or objective; relative or absolute? Tell me, what is truth? At first, Pilate finds no reason why Jesus should be sentenced to death. He even tried to persuade the crowd to let him go. However, being a quintessential politician, he soon caves to the madness of an unruly special interest group (the angry mob). But, not before attempting to avoid personal responsibility for sentencing Jesus to death by ceremonially washing his hands of the whole matter. Pilate’s well-known response to Jesus still reverberates in the hearts of mankind to this day. He said, “What is Truth?” When it comes to that question, you may be more like Pontius Pilate than you care to admit. As a Christian, I accept something as truth only if it is consistent with my understanding of the thoughts and ways of the Supernatural being whom I believe to be the designer of all things. The scriptures teach us that His thoughts and ways are on a much higher level than ours. Oh the foolishness of mere mortals to think they will ever be fully aware of what the architect of all things knows. God alone delineates truth because He is the truth. The Creator is the basis of all we perceive as reality. Truth as it is revealed to us by the Creator of all things is what sets us apart from the spiritually blind inhabitants of earth. When you are in tune with the one true God of the universe, you are, in fact, the genuine “illuminate” – the enlightened ones. That’s fine. Suit yourself. But would you at least hear me out? You are lost – I AM the way. You are deceived – I AM the truth. You are the walking dead – I AM the genuine life you need. Wow. Jesus claimed to have come from another world. He spoke of our need to listen to what he was sent to the earth to tell us. Jesus promised to reveal a definite purpose for our natural terrestrial life and then to guide us into a time without end (eternity) when this temporary physical existence is over. That’s not religion, philosophy, or dogma – that is the truth. He’s on the way back to the earth. Soon we shall behold Him – face to face. Until then, I’ll spend my time in comradery with those of like faith and remain occupied in the work that I’ve been called to do. Hopefully, I am investing my “gifts” wisely. That way, when my day of reckoning arrives, I’ll have something of eternal value to show for my life. What about you? Hmmmmm? For additional information write to: Coastal Junkie®, P.O. Box 1283, New Port Richey, Florida 34656. It is real, it is out there, and it could kill you! It is waiting…watching… and you might be its next victim. Let’s just say that it has your number. Do I have your attention yet? Wondering, “What is he talking about?” Isn’t that painfully obvious by now? I’m talking about – it! Something, nothing, the mountains, the molehills, – anything and everything – that leads to WORRY. And you really need to get over it! Are you the anxious, tense or uneasy type? Tend to go over and over and over the same mostly negative scenarios in your mind? Find yourself stuck on the what-if merry-go-round? What if I get a fatal disease? What if my dog gets hit by a car? What if I run out of money before I die? What if I have a heart attack or a stroke? What if terrorists blow up the mall while I’m shopping? What if I don’t live up to everyone’s expectations? That last one tells me that you are more concerned with the stuff people expect of you than with your own joy, peace and fulfillment in this life. Yes, the carousel just keeps spinning… what if this…, what if that…, what if the other thing? OMG what IF…! Ahhhhhhhhhh! What if you just chill for a few moments and hear me out; because, if you resonate at all with what I have said so far, you may be worrying your life away. In the process you could also be deeply wounding your human spirit, distressing your mental health, and taxing your physical well-being (aka: worried sick). I recently read a medical study that claimed, “Worriers are more likely to suffer from irritable bowel syndrome, nausea, fatigue, miscellaneous aches, pains, and numerous other maladies.” Yikes. I’m not a medical expert, but my powers of observation have shown me that worrywarts are often pretty miserable people. Oh really? So how’s that been working out for you? No matter how much you worry, fret and fuss, you cannot “foolproof” your little world. But, you are right about one thing: life often seems very out of control – more precisely – out of your control. Look, bad stuff happens. It doesn’t matter who you are. Happy people, sad people, good people, bad people, rich people, poor people – even really hardworking, honest, God fearing people; we all experience challenging and deeply painful moments. Worry cannot resolve nor prevent a single one of them. 40% of the things she worried about never happened. 30% of the things she worried about already happened (i.e. – it’s the past, get over it). 12% of the things she worried about were the expectations, opinions and criticisms of others. 10% of the things she worried about were unnecessary health concerns, which actually made her health worse through prolonged anxiety. 8% of the things she worried about were “reasonable concerns,” since life does have some real challenges to overcome. So, if just 8% of her fears were actually reasonable, how legitimate are your “worries?” I’d say there is a high degree of probability that you’re wasting a significant amount of time and energy fretting about things that are best left alone. No wonder you’re so worn-out. Apprehension is zapping your life energy. And for what benefit? As already stated, habitual and needless worry does not solve problems. And, even so called “reasonable concerns” are not an excuse for high anxiety. Most likely, your circumstances are not as ominous as you perceive them to be. Talk to God about everything. Let God know your concerns (what you need). Thank God for His solutions. The peace of God will calm you down and bring a supernatural rest to your soul (mind, will and emotions) when you put your absolute trust in Jesus, the liberator of spaceship earth. Got it? If you really trust in God, there is no defensible reason to worry. Remember, Jesus came to this planet to introduce us to a personal and relevant unseen “father” (God) – not a religion. You can talk to your other worldly father (God) directly about your concerns and ask Him to help you. When you finally decide that you will put God above everything else in your life and learn to consult Him first in every decision that you make; He will empower you to succeed at this thing called living. I didn’t say that you will never fail. Life is often full of setbacks and even some outright flops. Continue to acknowledge God first, and ‘He will direct your steps.’ (Proverbs 3:6) Do this over a lifetime and He will crown your efforts with the recompenses of eternity. Worrying accounts for hours and hours of invaluable time that you will never get back. Can all the energy you’ve wasted so far on anxiety heal your body, change your grades in school, improve your job performance, resolve a budget shortfall or protect you from identity theft? Has stressing out ever solved anything? If you are at least willing to be honest with yourself, the answer is NO. Why not give up all of your worries and fears by surrendering these so called “concerns” to God? He cares about you. He knows you better than you know yourself. He is also a fantastic listener. In fact, He is listening right now. Go ahead, talk to Him… Trust Him… Cast all of your cares upon Him… And please, stop worrying yourself to death! What would it be like if we were all born with a detailed life map encoded into the little grey cells of our consciousness? Imagine yourself actually perceiving with the mind’s eye every detail of your life from birth to death – in advance! How cool would that be? Want to know what you will be doing a year from now? Not a problem, consult the life map. Wondering if you will ever get married? Again, just access your life map to find the answer. Talk about the ultimate neural network interface. Nothing will ever take you by surprise. How awesome! But, not so fast. Here’s the caveat: You would have access to every moment by moment detail of your life, but you would not be able change a thing. Your personal life map would simply chart every triumph, pit fall, joy, pain, success and failure that you will ever experience along life’s way, but it’s read only – knowledge without any control. Are you still keen on that idea? Many years ago, as a young man in search of the truth, I once prayed, “O’ God, please, show me your will for my whole lifetime.” I thought it was a noble request. Why stumble around, making mistake after mistake, trying to discover and live my Divine purpose? I’ll just ask the Almighty to map it all out for me in advance. With my own personal life map in hand, I’ll simply follow the plan. Have you ever prayed anything like that? Thought about it, maybe? Deep inside, I think we all would like God to be upfront and spit out the nitty-gritty details of our destiny here on spaceship earth. “I want to follow you Liberator Jesus, but please let me see everything you have planned for my life so I can make an informed decision.” You know what I think? If our Creator ever agreed to show us our life map, and we saw all of its darker moments in advance, we’d opt to take a pass on this journey altogether! “Thank you God, but, I saw some real yucky things in my life so… I’ll just pass on this whole deal.” Like it or not, everyday life is a walk in the unknown. Every step is a revelation. It requires a natural faith to live out each day. It’s the same when it comes to following the Liberator Jesus. Genuine Christianity is a calling – not a religion. If you hear the Creator’s voice, and he offers you an invitation to come aboard the great ship Redemption, there are only two ways you can respond to that call – yes or no. Sorry, it doesn’t work that way. To come aboard this ship, you have to first say “yes” to Captain Jesus. This requires an act of faith on your part as you will now weigh anchor and sail life’s uncharted waters with the Creator Himself. The eyes of faith can peer into the realm of the Almighty. They see things which, at present, may be non-existent here on spaceship earth, and yet they see those nonexistent things as if they already were a reality. How? Now you ask of mysteries. Grasp this if you can; faith is reality. It gives substance to our hopes and acts as the evidence of what, at least at this moment, cannot be seen with natural eyes. By faith we enter the regatta (race) that is set before us. And, it is faith which enables us to stay true to the appointed course as we endeavor to finish our race with patient endurance. Swiftly, steadily, the winds of faith move us forward. By faith we avoid obstacles and if necessary, even move mountains. By faith our lives are spent in the service of the Almighty and as a result, we fulfill our destiny. By the way, that life map we spoke of earlier really does exist, but only the Creator can see every detail in advance. Thankfully, we have an otherworldly pilot living inside of us called the Holy Spirit. He lets us grasp what we need to understand on this amazing voyage of adventure whenever it suits the Divine purpose and serves as our navigator in this life. And on that note, anchors aweigh my friends; be there glassy seas or squalls on the horizon, steady as she goes. With our life compass set by the indwelling Spirit of our Creator, we’re on our way home. Ahoy mates! I love it! Mr. Ford liked to keep it simple so he narrowed the choices. Let’s talk about choices and the simple life. Have you visited a new car showroom lately? It can take hours just to pick a color, let alone choose from all of the available options. I’ve seen families spend weeks trying to decide what style and model of car to buy. It has become such an ordeal that some people may soon need counseling to get through the experience. With the introduction of touch-tone service, the trusty old 500 series was refit with a push-button keypad. First a 10 button model was introduced in 1963 followed by the 12 button model we know today in 1968. And get this, you didn’t own it! That’s right. You rented the phone for a monthly fee. 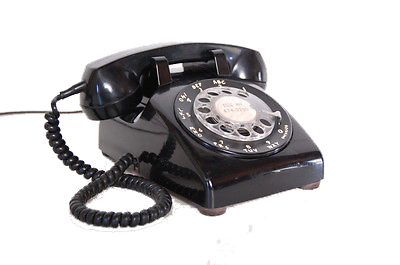 Even worse – everyone in the household used the same phone and it was attached to the wall by a wire! Oh the pain, the pain of it all. Today, choosing a phone can be more nerve racking than a broken front tooth the day before your wedding. Right now, there are no less than 103 different cell phone brands available. Collectively, they offer multiplied thousands of models. Let’s not forget all the monthly “plans” and the associated need to decide which one is right for you. Will you choose the family and friends plan, or maybe the neighbor and coworker package, or perhaps the friends, Romans and countrymen plan? (Okay, they don’t have that last one). Fear not, when you finally settle on the combination of data, text messaging and who you can call, when you can call and how many minutes you can talk – surprise – that plan will be phased out. Have you ever sat down and tried to choose a family vacation destination or even just a place for the whole family to dine out? In my household we must approach this task delicately – and unarmed – or we’d all be on death row by now. There are too many “options”, making a group consensus nearly impossible. Everywhere you turn – decisions that involve multiple choices await you. Like grocery stores. Forget about it, there are dozens of selections for just about any single item you want to buy. What about appliance centers? I want a refrigerator. Who knew they made hundreds of different models? They’ve got ones that practically grow and process the food. Look at all the furniture outlets. No wonder they have a going out of business sale every two weeks, there are not enough people alive on earth to purchase all that stuff. I saw a man sleeping on one of the sofas at the local mega-décor store. I believe he collapsed from exhaustion just trying to see everything. And, let’s not bring up clothing. Some people are ready to convert the garage into a walk-in closet and that’s just for their shoes. It already takes them over an hour to pick out a shirt. Soon they will be unable to make that choice as well. Probably join a nudist colony – hey, no clothing decisions there. I now understand why so many people are walking around malls and other shopping centers murmuring in a semi coherent state. They can’t decide on anything. Better to just keep wandering, texting and hoping for the best. Okay, I’ll cut the drama now. There is a point here. Choice overload is very real. Alvin Toffler, the writer, futurist and former associate editor of Fortune magazine wrote, “Over-choice takes place when the advantages of diversity and individualization are canceled by the complexity of a buyer’s decision-making process.” (2) To put that in simple terms – when you have too much to choose from you can become confused and overwhelmed to the point that you cannot make a decision at all. And often, you don’t. Or, you make poor choices. For years we’ve heard the clarion calls of culture declare “more is better” or “he who dies with the most toys wins!” Bunkum! What is your peace of mind (soul) worth? Will you continue to sacrifice your soul for the latest cell phone, more money, a newer car, boat, or house? To lead a better life, we need to rediscover the simple life. The pressure to accumulate what you really do not need or to climb to new heights where you really do not belong can kill you. No, I take that back, if you are empty inside, you are already dead. The choice here is simple. No confusion. No overload. Choose his way and gain a timeless life, filled with inner joy and peace. Or just keep doing things your way. It’s your life, your decision, but I do hope you choose wisely. Now, if you’ll excuse me, I’ve got my toes in the water and my… well, you know the rest. Life is good today. My Father in Heaven, please help my friends to find rest. Show them how to slow down and how to avoid the overload of too many choices. To shed the weight they carry and find forgiveness and a new life in Jesus. Thank you my God. Amen. SO, YOU DO NOT LIKE CHRISTIANS ? Mahatma Gandhi (born Mohandas Karamchand Gandhi on October 2, 1869 in Porbandar, India) was an activist and religious contemplative. He began his involvement in social activism in the early 1900’s as an Indian immigrant in South Africa. In the years following World War I, he went on to become the primary leader of India’s struggle to gain liberation from Great Britain. Gandhi is perhaps best remembered as the father of nonviolent passive resistance. Employing peaceful civil disobedience, Gandhi led India to independence and inspired movements for non-violence, civil rights and freedom across the world. Mahatma (which means “great soul”) was a Hindu. He greatly admired some of the teachings of Jesus. In fact, some historical narratives affirm that the Sermon on the Mount shaped his whole philosophy of life. But Gandhi was not a Christian. A true follower of the Christ is much more than someone who simply regards Jesus as a “great teacher” or a “wise prophet”. Some writers tell of a missionary named E. Stanley Jones who asked Mr. Gandhi why he so often quoted the words of Jesus and yet appeared to so adamantly reject becoming his follower. Gandhi allegedly replied, “Oh, I don’t reject your Christ. I love your Christ. It is just that so many of you Christians are so unlike your Christ”. Mr. Gandhi, I agree with you. Christians are often a mess. Many are hypocrites. Sometimes they even act like the devil. But sir, no one has asked you to follow the Christians. My question to you again is, why are you not a follower of Jesus? Followers? That’s what it says. Of whom? JESUS, of course. Certainly not you or the brand name of the church you attend. Not the newest Christian movement of the month either. Our commission is to help others become followers of JESUS and teach them to obey His words and imitate His life. The Gospel (which simply means GOOD NEWS) is all about Jesus. He is the liberator of mankind and the source of true wisdom, knowledge and understanding of human life on earth. The Gospel message is flawless. It declares the love and grace of the creator of all things (God) toward a doomed world. Christianity is not flawless. Christianity is simply the imperfect human interpretation (response to) and inconsistent expression of the Gospel message. Only Jesus is perfect and He is the perfector of mankind. Christianity (the Church) at best, is an imperfect work in progress. Paul was fully aware that the arrogance of Greek philosophy would likely dismiss the message of the Gospel as “foolishness.” It would be out of step with their cerebral conjectures. But he was also convinced that the Good News contained the one philosophy that fulfills every human need. The Gospel message presents the finished work of Jesus (the Christ) in an easily understood format to a lost world. Jesus represents the perfect man even as he is the very manifestation of the incarnate God visiting this planet. So, whether to the Greek (non-Jews), or to the Jew, Paul was not ashamed to preach the Gospel message. I find no shame in sharing the wonderful Good News of Jesus with anyone who would care to listen. But please make no mistake, as a Christian, I am not asking you to follow me nor am I asking you to attend my church or “get religion”. I am asking you to hear what Jesus had to say and follow Him. We are lost and depraved people stranded on a doomed planet in need of enlightenment and liberation. The remedy for our dilemma is made known in the gospel; a gracious method of redemption through the liberator Jesus who restores us to a position of favor with the creator of all things (God). Faith (trust) is the catalyst, both at the inception and through the progression of the Christian life. By faith (trust) we secure our liberation, and by faith (trust) we gain the victory over unbelief. “The just shall live by faith.” A life of faith is a life of trust and obedience. Gandhi may have had one point worth a moment’s ponderance; if the word Christian means follower of Christ, is it so unreasonable that our contemporary world balks at Churches filled with people who seldom practice what they preach? The Scripture urges all Christians to “Be doers of the Word and not just mere hearers lest you deceive yourselves” (James 1:22). It is not enough to just say “I am a Christian”. Our way of life should reflect the Jesus we claim to follow. A Christian is one whose life is built on the teachings of Jesus and the New Testament writers. But remember, Christians are not faultless – far from it. That is why you should not judge the validity of the Jesus message by the level of application found in his disciples. A true Christian is someone who has found rest for their soul in the liberator Jesus and who attempts to live the life that Jesus modeled when he visited earth. Christian – the world is watching you. People are reading the “Book of You” every day. What message are they receiving? Hmmmmm?